Ten tiny toes but not a single fully formed bone! It’s true.The shape of your baby’s foot is mapped out in soft, pliable bone surrounded by a layer of subcutaneous tissue, otherwise known as ‘puppy fat’.It’s what gives every baby’s foot that unmistakable soft, squidgy feel. Unfortunately it also makes the foot prone to being bent out of shape, without you noticing and without your child feeling any of the pain that might otherwise alert you to a problem. As your child grows, so too does the bone structure in their feet and by the age of three, your little one’s foot will have started to develop the full 26 bones. The final structure, however, won’t be in place until your child is in their late teens. 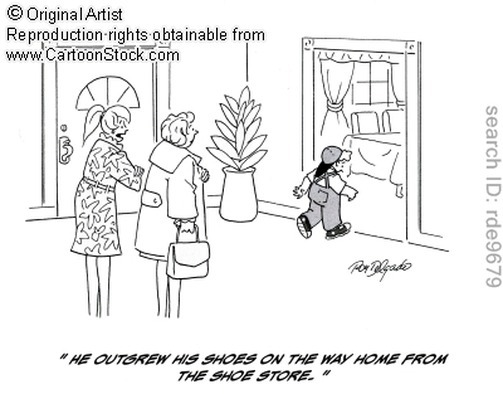 Until then, they’ll need shoes designed specifically for each stage of their development. Why? Because shoes that don’t fit properly can prevent natural growth, cause discomfort and lead to health problems. They can even adversely affect your child’s walking development. The shape of your baby’s foot is mapped out in soft, pliable bone surrounded by a layer of subcutaneous tissue, or puppy fat. We are recognised by Clarks as Clarks Platinum Specialists, which means we are an extremely select group of fitting experts who guarantee a complete fitting service and offer a comprehensive range of Clarks styles and width fittings. We stock many quality brands and have the most comprehensive range of boys and girls shoes in 1/2 sizes and multiple width fittings in Queensland, so we can guarantee a perfect fit! "Shoes that don’t fit properly can prevent natural growth, cause discomfort and lead to health problems." Tammy and her qualified staff have clocked up a combined total of more than 70 years of experience in fitting children’s feet. You can be assured that your children’s feet are in safe hands at Tammy’s Children’s Shoes. Tammy’s stocks a number of quality brands and has the most comprehensive range of Clarks shoes in Queensland. Over the last 180 years Clarks have learnt a lot about little feet. It’s helped them create an exceptional range of shoes which, in the safe hands of our specially-trained fitters, guarantee the best possible fit for every step of your child’s development. So whether your child is taking their first wobbly steps, starting school, or growing up into a dedicated follower of fashion, Tammy's has shoes to suit. Each range that we stock is designed to provide the comfort, features and look your child needs as well as wants. Though most kids' shoes now feature Velcro closures, learning to tie ones own shoes is still considered to be milestone that children should master by five or six years of age. But, teaching a child to tie his own shoes can be frustrating; kids can lose interest quickly if they feel the task is too difficult, or they may seem to "get it" one day only to completely forget the next. Have no fear, there a few tricks up my sleeves that can make teaching a kid to tie his own shoes a bit easier. All kids learn differently, so try a few of these methods and see what works best for your child. Probably the most common method for teaching kids to tie their own shoes is the "Bunny Ears" method. Tell the child that he needs to make his shoe laces into "bunny ears." First, he needs to secure a knot for the bunny's head. Take the laces and cross them over to make an "X". Then, pull one ear through the bottom of the "X" and pull tight. Say, "Now we need to give bunny some ears." Loop the laces into "bunny ears". Tell the child that now we need to "make the bunny ears tight so they don't fall off". Then make another "X" using the "bunny ears", slide one "ear" under the "X" and pull tightly. This is a great tip that can really make learning to tie much easier. Take two laces in two different colors and cut them down the middle. Then sew them together to make two bi-colored laces. Lace a pair of old shoes with these funny shoes strings. Using bi-colored laces can really help a kid who has trouble remembering his right from his left. You can use any learning-to-tie method in combination with your bi-colored laces. Take a cardboard box and cut out an over-sized shoe shape. Have your kid decorate the shoe in any way he wishes. Using a pen, poke holes for laces. Use the bi-colored lace tip above, but instead of cutting the original laces in two, use two entire laces sewn together to create one long, bi-colored shoe string. Lace the shoe and use any teaching method, using this cut-out. Some kids find it easier and more interesting to practice on an over-sized model. This is a fun method that uses kid friendly story and movements that help kids understand and remember the basic steps to shoe tying. Tell the child to create "tree roots" by making a starter knot. Make a tree with a long thin loop; hold the loop in the child's right hand. With his left hand, take hold of the lace and tell him that a squirrel runs around the tree and jumps into the hole under the tree and comes out the other side (he'll need to switch hands at this point which can be difficult for some kids).